We are overjoyed to announce that Munapest is coming for the fifth time in April of 2019! 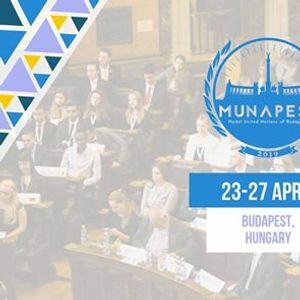 Our beloved conference is Hungary’s largest university-level Model United Nations with over 180 participants from all around the world! Because Munapest is not your average MUN! Because of the lovely Budapest, the social capital of Europe! 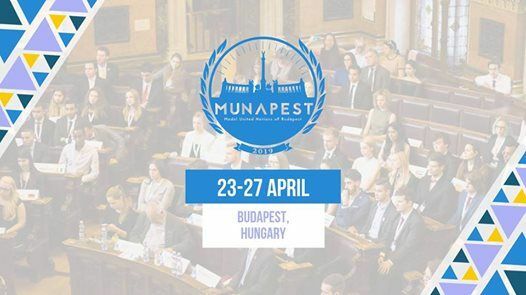 … and we need YOU to make Munapest 2019 a success! - Participants’ pack including the Participants’ Handbook, pen, paper and many more! Please note that although your preferences will be taken into account, we cannot guarantee that you will be allocated to your chosen state or chamber. Follow the event and our Facebook page for more!